Sunday Times best-selling author of A Short History of Nearly Everything, Bill Bryson, teams up with The Science Museum to celebrate the ideas and inventions of the incurably curious. Across this five-episode series, Bill Bryson, with the help of The Science Museum's curators, takes us object-by-object through some of the museum's lesser known inventions and discoveries - and the human stories behind them. Discover how a teenage inventor, a pig's head, a lump of plywood and a famous British record label made medical history or how some inventions simply happen by accident. This 'museum for your ears' looks at how experimentation, competition, hard work and a desire to change our lives for the better have contributed to the progress of mankind. 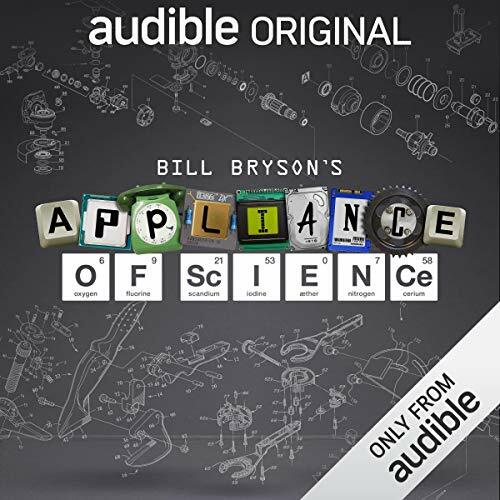 As an Audio Show - free for members - when you add Bill Bryson's Appliance of Science to your library, you'll get all 5 episodes, each with a runtime of about 20 minutes. Interesting stories but would be better with pictures. Sometimes it is hard to imagine what is being described. But the storyteller keeps your interest. Very informative, engaging. But ruined by abysmal editing. This “audio tour” touches on unique history on pop medical solutions. I liked this and found it interesting and entertaining. I liked Bill as narrator. Great listen. Fascinating facts with unexpectedly dull presentation. Which pains me to say because I love Bryson. I really enjoyed this series and had no trouble picturing and understanding what they were talking about.